I don't know what it is about this pregnancy but I have been craving Thai Food, like I want to eat it everyday! I seriously crave it. I decided to take a gamble and try my hand at making my own Thai food. This was totally out of my comfort zone, but the risk paid off. This curry was amazing. Matt kept raving it was better than the curry we get at our local Thai Take-Out place. I will be making this again and again. The flavors were so rich and complex. If you don't like chicken I am sure you could sub beef or shrimp (I just would not cook the shrimp as long). You could also serve this over noodles instead of rice, but rice is how they usually serve the curries in restaurants. I recommend using the full fat coconut milk it gives the dish great depth and flavor. Glad to know I can tackle Thai Food, and you can too! Sautee Zucchini, bok choy, and bamboo shoots in olive oil until tender and set aside. Toss the chicken cubes in a Ziploc bag with one tablespoon soy sauce and two tablespoons flour. Shake up until they are evenly coated. Heat olive oil in a large skillet pan and add the chicken. Cook about 7 minutes flipping the pieces some. The chicken does not need to be cooked all the way at this point it will keep cooking later. Remove the chicken from the pan and set aside. In the same pan add a little more oil. Then add green curry paste, green onions, garlic, and ginger and cook about 1-2 minutes til fragrant. Then add chicken back in and make sure it is evenly coated in curry mixture. Add in coconut milk, fish sauce, 1 tablespoon soy sauce, and sugar. Then add in sauteed veggies. Let this simmer on medium low about 30 minutes or longer. Cook white rice according to box. 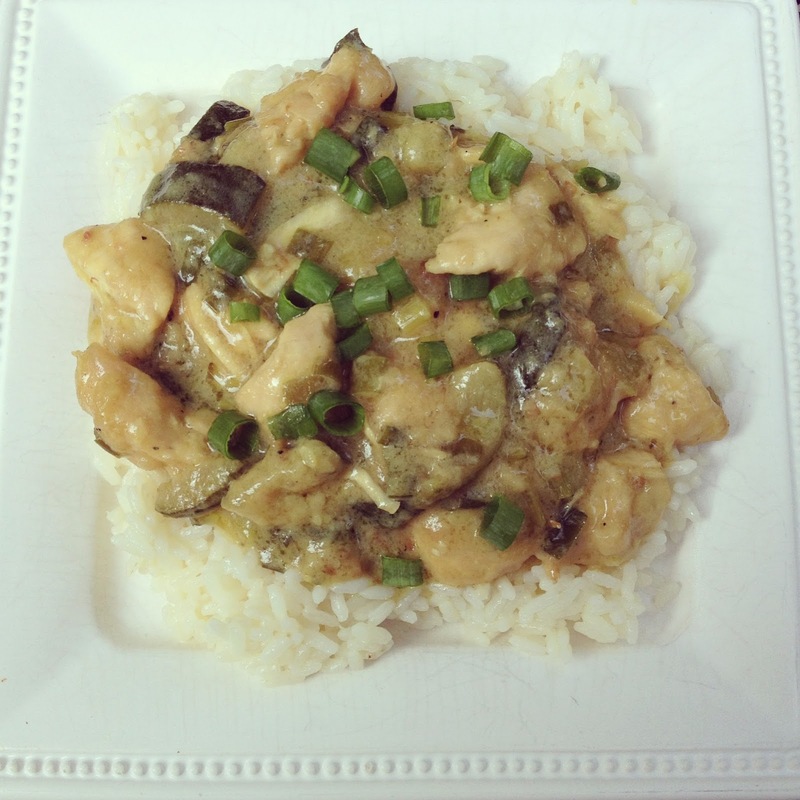 Spoon white rice on a plate or bowl and top with green curry chicken mixture. Top with thinly sliced green onions. Love a good Thai dish, this sounds amazing! Thai food is my FAVORITE!! My man thinks I'm part asian because I could eat thai, chinese or sushi every day! Can't wait to try this!! So glad you posted this recipe. I'm obsessed with thai food lately! I am a sucker for green curry. Which green curry paste did you use? I recently tried the kind by Thai Kitchen and it was grossss! Curious to see what you liked! Love! I will have to try this. My favorite Thai restaurant in law school had this amazing Panang Curry. You should try that next since you are craving it! This looks super yummy! I will def be making! How funny, all I wanted to eat for my second pregnancy was Thai too! This looks great. I will have to try it soon. this looks delicious, I crave Thai on the reg too! OMG I am soooo hungry and we have no flipping food here that i want and this looks sooooo good. i crave thai regularly, too!!! will have to try this fo sho. Made this tonight and it was amaz-balls!!! My husband loved it too. Thanks for sharing! !